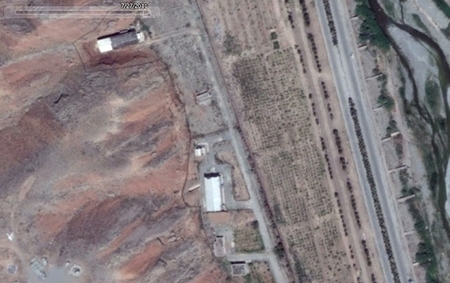 Parchin test facility near Tehran. Courtesy of Challah Hu Akbar. Click the picture for details and more photos. Today, as suspicions about Iran’s nuclear ambitions have provoked tough sanctions and threats of military confrontation, top administration officials have said that Iran still has not decided to pursue a weapon, reflecting the intelligence community’s secret analysis. FresnoZionism has decided to help the Obama Administration find out what’s really going on in Iran by applying its until-now secret technology: a drone so small that it can pass as a fly. Iranian 1: Your Excellency, I bring you greetings from the Pure Research for the Good of Mankind Center located in Parchin. Iranian 2: Wonderful! How are the tests of the new device to, er, cure cancer, proceeding? I1: Well, we managed to achieve almost-simultaneous — within one microsecond — detonation of high-explosive shaped charges. I2: Great! That should take care of those pesky cancer cells. There isn’t any other area of research that this could possibly be useful for, is there? I1: No, Excellency. Only curing cancer. Or very rapidly increasing the density of a chunk of, er, heavy metal, if we should ever want to do something as pointless as that. I2: Of course. What good would that be? What else? I1: We had Molly Maids come out and vacuum the place. We were practicing compressing heavy metals — as if we would want to do that! — and some of the heavy metals escaped the containment vessel — er, the laboratory — and dirtied up the dirt around it. I2: Oh, Molly Maids? I hear they do a good job. Wasn’t that expensive, though? I1: Yes, but it was necessary. Those IAEA pests were bothering us about inspecting the site again. I2: They just want to steal our secret cancer-fighting technology! I1: Yes, Excellency. We won’t let them. I2: The Americans want to steal it, too. I understand they have agents everywhere. Well, listen to this: I HAVEN’T DECIDED ANYTHING! NOTHING IS DECIDED! I NEVER DECIDE! Get it? I2: Damn it, there’s a fly eating my cookies! Swat it at once! At this point, the transmission ceased. But we are presenting it in the hopes that top administration officials can make sense of it. This entry was posted on Sunday, March 18th, 2012 at 8:30 am and is filed under General. You can follow any responses to this entry through the RSS 2.0 feed. Both comments and pings are currently closed.